What is one book trope that gets on your nerves? What do you wish the publishing world would STOP doing? Okay, this one isn’t too hard for me. I hate that vampire books have these weak, defanged vampires who don’t prey on people because it’s wrong and have managed to find ways around being horrible killing machines. Either they kill and drink blood only from animals, or perhaps they just take a little bit of a human’s blood but not enough to kill. If you’re going to be a vampire, you should be full on Dracula. Even Anne Rice understood that with her antihero Lestat. One reason the first few books in her Vampire Chronicles were interesting was that Lestat was a killing machine. Powerful. Unpredictable. Often completely without a moral compass (c. f. the making of Claudia). I think we can blame Stephenie Meyer for this trend. She made Edward dark and edgy, revealed he was a vampire, and then took all the real danger out by reassuring the reader that the Cullen clan only hunted animals and drank animal blood. Come on. I saw it continue with Deborah Harkness’s vampires in the All Souls Trilogy. The vampires in her books, at least the ones in Matthew de Clairmont’s family, either only take a little blood from willing donors (like Diana Bishop), or they hunt animals. They also drink wine, which is really weird to me. What the heck is happening here? Bram Stoker would turn over in his grave. Vampires are supposed to be frightening creatures who will kill you. They can be tortured and despise themselves for what they have to do, but they do it because they are vampires and killing people is what they do. I’m actually swearing off vampire books for a while. If writers are all collectively deciding right now that vampires have to be relatively harmless, then I quit. I truly did enjoy the first few books in Anne Rice’s Vampire Chronicles, but I haven’t really enjoyed one since The Tale of the Body Thief. I actually threw Memnoch the Devil across the room. It remains to this day the only book I have actually thrown across the room. I am just going to quit giving her more chances after Prince Lestat. 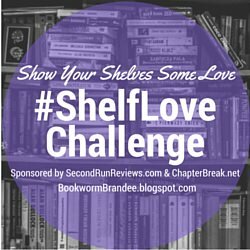 A quick check-in on how I’m doing with the #ShelfLove Challenge—so far, so good. I elected to try to read between 11-20 books that were already on my shelves (either my physical shelves or my Kindle or Audible library) before January 1, 2016, and so far, of the twelve books I’ve read up to this point, four of them have been #ShelfLove books, which is no change since last month, but I had done so well early on that I’m not worried. I definitely see your point about vampires. They should be scary and killing machines, but people don’t really enjoy reading those as much. I think a good balance is needed, maybe only kill other killers, but still have to kill humans to survive. That’s one way to create a more friendly vampire character who is still a true vampire. But these days, most of the scary creatures have been made tame. The best vampire books to me are the ones where the vampires are bloody-minded predators but are not slaves to their hunger. So I loved Robin McKinley’s book Sunshine, and also Holly Black’s The Coldest Girl in Coldtown. If you are ever willing to try again with vampire books, those are two I can recommend. I’m a fan of Eric and Bill from the Sookie Stackhouse series. I did like a brooding Louis when I was in college. However, I think Lestat would be far more entertaining. A good book is the precious life-blood of a master-spirit, embalmed and treasured up on purpose to a life beyond life.